Occasionally, a certain type of game will come around. The type of game that is perfectly suited to its platform. One where everything comes together to form a beautiful package; where the gameplay complements the graphics which complement the sound which complements the level design. One where it’s so damn perfect, criticising it is almost impossible. 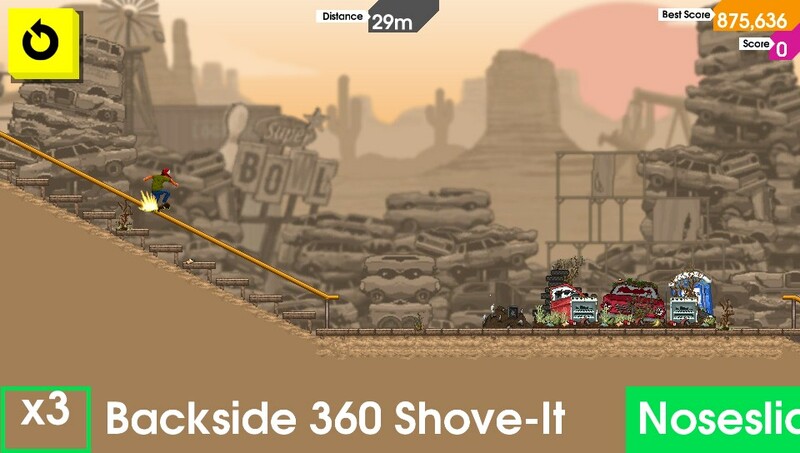 OlliOlli is that type of game. Roll7’s skateboarding Vita game is ridiculously good. 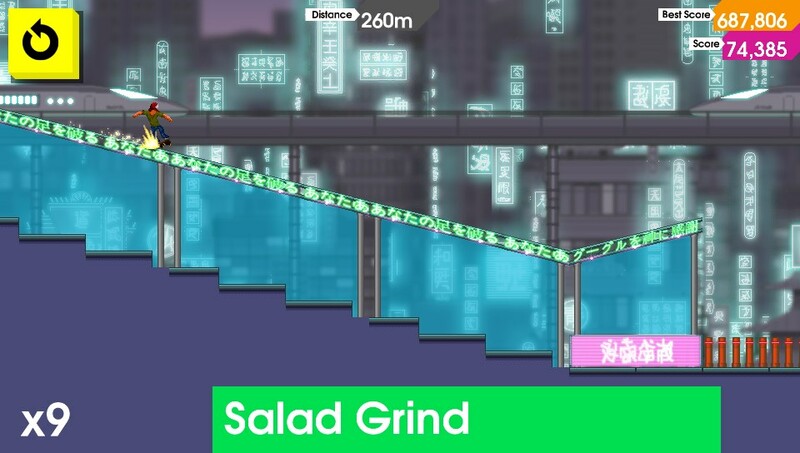 The premise is simple: a bunch of levels which you skate through, pulling off tricks and grinds in order to achieve a big high score. Yet this simple premise has led to one of the most in-depth, intense and addictive games I’ve played in a long, long time. There are 50 levels in Campaign Mode, and all are just short enough that you want to play them over and over again, in an effort to increase your score. 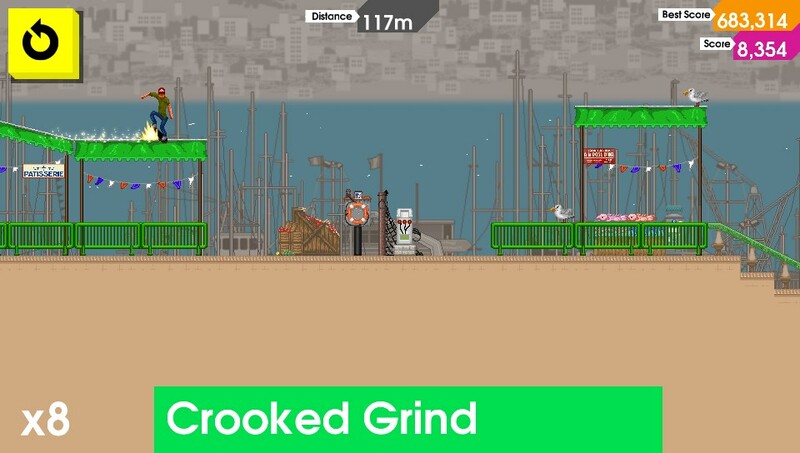 OlliOlli is incredibly easy to pick up, with simple controls: use the left stick to pull of tricks and press X to land. That’s it. But it’s also incredibly difficult to master. Getting the timing right to pull off a complicated jump isn’t easy, and figuring out when to jump off a rail is also a little challenging. The satisfaction you get from pulling off such great tricks outweighs any difficulty you might have in getting there: there’s an overwhelming rush of pleasure and achievement; one that’s all too rare in games these days. And as with any good dopamine rush, it’s addictive. The sounds that the tricks make, with their satisfying clicks and gorgeous grind noises, keep you wanting more and that’s complemented by the top-notch visuals. I’m not just talking about graphics or aesthetics here (although the retro, arcade-y art style is great): the sparks that fly off the bench whilst you’re grinding on it, the grace with which you move through the air having completed a perfect grind…it’s magical. It helps that the UI is very in-your-face, constantly reminding you of your combos and high scores, and constantly driving you to do better. The fact that load times are non-existent means you can restart a level instantly, so whenever anything goes mildly wrong you’re immediately sucked back into trying it again. This drive for perfection will ensure you fall into the “only one more go” trap, resulting in hours of time lost to this game. This is particularly evident in the last few levels, where there is an excessive difficulty spike that stops the game from being fun. It becomes a chore, but you’re already so addicted that you can’t stop playing. If there’s one thing I’d criticise Roll7 for, it’s for the slight laziness that went into the later levels, where the game stops being about high scores and starts being about whether or not you can finish it. 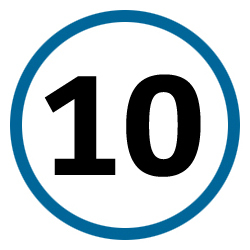 Once you do finish, though, there’s a wealth of content for you to continue enjoying. Each level has five challenges that you’ll want to complete to get full completion (they range from getting a certain score to collecting some spray cans, and one even tasks you with grinding down a dinosaur). There are also a whole bunch of “spots”: opportunities for you to get massive combos and big high scores. The social aspect will be of significance here: you can see what your friends got, and will thus inevitably try to beat them. The biggest social aspect is the “Daily Grind”: a unique spot will be put on offer each day, for one day only. You only get one shot to play it (you can practice beforehand, but your score there doesn’t count), and that amps up the pressure in what’s already a very tense game. As long as the Daily Grinds keep being fun (which I’m sure they will be), you’ll never run out of new content for this game. And it’d be remiss of me to forget the brilliant soundtrack, featuring driving dubstep (as featured in the above trailer) and quieter, more laid back trance beats. This is the icing on a cake that has already been perfectly baked. OlliOlli is the Vita game. It is perfectly suited for the platform: short, pick up-and-play bursts of top notch, hyper-addictive gameplay. Even five minutes of this is brilliant fun, and that in itself should convince you that this is a brilliant game. Considering it’s only $13/£8 ($10/£6 if you’ve got PS+), you would be mad not to buy this. It’s quite possibly the best game on Vita. OlliOlli is out now on PS Vita (out on January 22 in Europe). Review copy kindly provided by Roll7.